Well, in an effort to close off the year right, I took part in the local Running Room "Resolution Run" 5km this evening. Grant picked me up at a quarter to 6 and off we went to await the beginning of the challenge. Grant is a great runner, and so he moved up to the front, with the hopes of running a sub 22 minute 5k (this is with only maintenance running in the last little while, no specific training for this race). I hung back and awaited the gun. Well, it's passed... and suprisingly enough, I enjoyed it. I don't know if it was the knowledge that this was the longest run that I'd have to do before the marathon (according to Hal's plan), or whether it was the weather (rainy, overcast and fairly cool, but not too windy), or whether it was listening to my iPod, or whether it was just that I was running at my own pace. Nevertheless, I had a great run - and for me to say that about a 20 mile run is certainly something - and it gives me a boost of confidence heading into the marathon. So, this is it... The big week of training, the 40 miles in a week in preparation for the marathon. I did 5 miles last night as seen in the photo. I'll probably do the same run Thursday, which leaves today's 10 mile run on the treadmill and Saturday's loooong run of 20 miles around downtown Ottawa (from my place, down to the western end of Byron, over to the river, to parliament, along the canal to the arboretum, into the experimental farm, big loop and then back to my place... crazy). Well, a few weeks and no posts is no good. But I'll put an end to that for at least a moment. 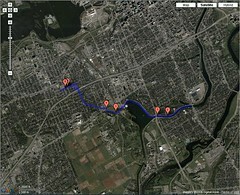 Did my long run yesterday, Sunday was a change since I went to Belleville for the first part of the long weekend. Then it was back on Saturday afternoon to have a nice evening with Meg, a run Sunday and then off to dinner with Meghan's parents. The run this Sunday wasn't as bad as last weeks, this was only 12 miles, but there was still a bit of a headwind at times (and headwinds and I are mortal enemies....). The 16 miles Kev and I did from Stittsville to Richmond and back last weekend were much worse. I kept up to Kev for probably somewhere in the 10 mile range, but after that the headwind destroyed me. I split a lot of walking at that point with some running. 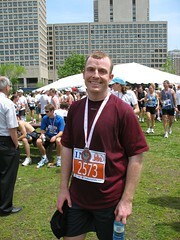 I finished 20 minutes behind Kev, but, at least I finished.